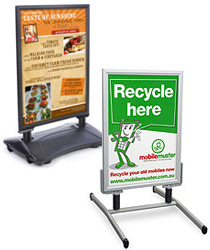 Looking for floor poster displays? Freestanding sign stands provide an excellent way to advertise and promote throughout a wide variety of commercial environments. Part of the reason the signage holders are so useful is that they feature very simplistic designs. In fact, many durable floor poster displays generally feature a "quick-load" or "snap" design so retailers and other advertisers can change messages on the fly. Metal, MDF, and plastic are the primary materials used during manufacturing, but they all feature high quality craftsmanship regardless of what they are made of. 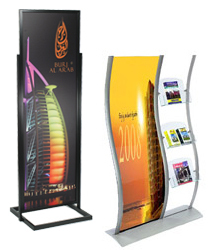 A ready made floor poster display, sometimes called a commercial signage holder, is perfect for use in high traffic areas because of durable construction and security features. 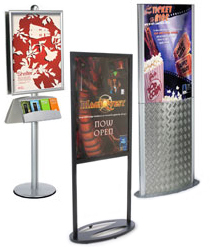 So what types of floor poster displays for business use are most effective for merchandising and showing information? Selecting the best unit depends on the specific application. Our online selection is vast and features many different options, from basic single sided sign stands to A-frames, double sided sidewalk signs & sandwich boards. What are the different styles of freestanding advertising sign holders? 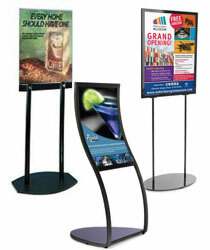 Most of our floor poster displays are separated based on size or functionality. This way, customers can shop using their print media dimensions as a guideline while thinking about how they want the system to work. Some of the smallest designs are the sign stands. These lobby displays are perfect for office entryways, factory showrooms, and restaurants because new graphics can be added so easily. The sign stands are sold with snap open, slide-in, or flip-open framing. All of these designs are extremely easy to use. Some of these models also include bonus features, such as magazine or brochure pockets. Mid-sized stands range from 14" x 22" to 22" x 28" and can also be purchased in several configurations. There are front-loading, side insert, and top insert models to choose from. Certain lines, including the wooden poster display stands, come with literature pockets as well. There are several double-sided systems and some units even offer adjustability. 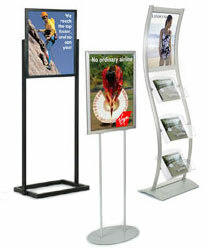 The largest poster display stands include the very popular 24" x 36" size as well as some taller, less common media sizes. Like the other models, these freestanding advertising pylons and enclosures are also sold in front-loading and slide-in configurations. 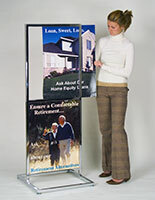 Monolith-style units that include snap open frames are quite popular due to their ease of use. Choose from a complete selection of stands including modular, curved, outdoor, double-sided, and multipurpose. Sidewalk signs and sandwich boards are also available. 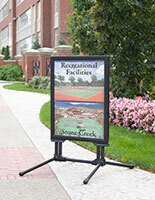 These A-frame displays are typically designed for outdoor use at restaurants, retail stores, and other businesses. They are not separated by size, but many of the most popular poster dimensions are represented. Choose from models with water-weighted bases, spring-loaded framing, snap-open holders, slide-in designs, and more! 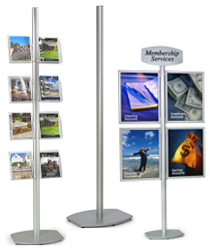 What are some common locations for sign display stands? Retail locations, like department stores and gift shops, frequently implement these sign holding stands. Here, they showcase new merchandise or recently added brand names. Many store managers and owners use the displays to detail sales or upcoming events. Letting customers know what services are available as soon as they enter helps streamline their shopping experience. Styles that feature magazine baskets and literature pockets are ideal for public events, such as conventions and open trade expos. A community building is another great location to use one. Universities and college campuses help parents and students navigate the grounds by providing directional information. Travel agencies love to supplement their postings and sign exhibits with print-outs or flyers. 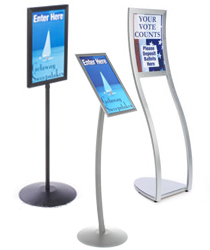 Some of the units are even large enough to be set up as kiosks or directory sign display stands. These are frequently found in shopping malls, transportation terminals, and other sizable buildings, where visitors need help locating particular areas. Our full selection of frames and stands can be accessed online any time, which makes it easy for customers to find the perfect match for their advertising or marketing needs. Pick the style that has the features you need, like brilliant lighting systems, decorative designs, wheels, pockets, or shelves. No matter which type of ready made graphics holders you pick, you will be satisfied with the results. Potential clients and passersby will have no choice but to take notice of your picture, movie poster, placard, print, or other sign. High visibility is crucial to the success of any signage so find your display today!